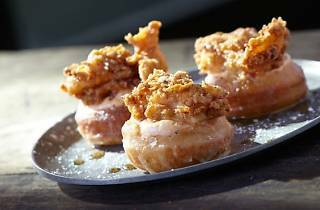 In honor of a 76-year-old holiday that everyone can get on board with, Sixth St Tavern serves up a sweet-meets-savory treat that combines two of the greatest foods on earth: donuts and fried chicken. National Donut Day started in 1938 during World War II, when a military doctor began handing out donuts to wounded soldiers, an act of sugar-centric kindness that soon became a Salvation Army sponsored fundraiser, and later, a holiday. 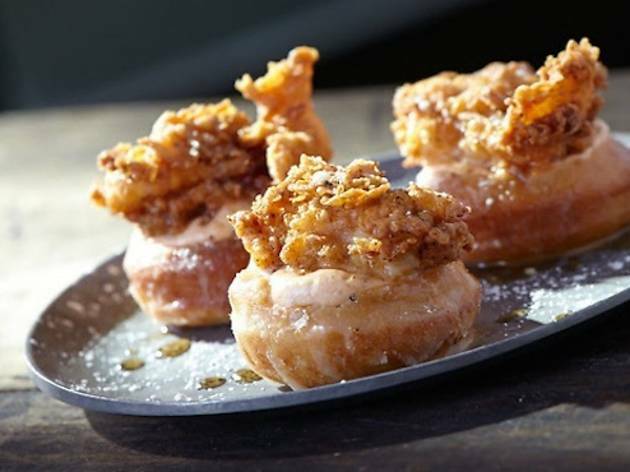 Celebrate National Donut Day by cruising downtown to try Sixth St Tavern's exclusive maple-glazed donuts and buttermilk fried chicken, served in a bright pink box with Tapatio whipped cream on top. Wash your masterpiece down with one of the tavern's 24 revolving craft beers on tap, and you can call yourself both a satsfied eater and a good American.